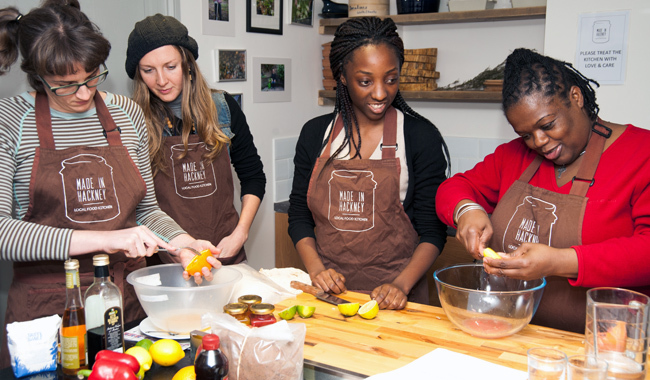 AMURT UK is proud to have incubated award winning community cookery school Made In Hackney. This project was part of the AMURT UK portfolio from September 2012 until January 2018 when the project became a charity in it’s own right. The new charity has it’s own separate board and runs independently of AMURT UK. Opened in October 2012 thanks to Big Lottery funding in it’s first year it helped a staggering 1000 plus people learn vital food growing, cooking and composting skills and has been featured in the Observer newspaper, Vogue and Jamie magazines. To our knowledge it is the only community kitchen in the UK with a strictly local, seasonal, organic and plant-based food policy. Made In Hackney works with local charities, community organisations, housing associations and support groups to ensure people most in – low income families, children in care, teen carers, young people excluded from school, parents and children, people with long-term health problems – have access to our courses. Past service users include: Action For Children, Hackney Social Services, Kids Company, Off Centre, Inspire!, Catch 22, Mind Yourself, Lee House, London Orchard Project, Linden Childrens Centre, Wilton Estate Residents, North London Muslim Cultural Centre, the Otesha Project and the Womens Environment Network. Our teachers help learners develop the practical skills to feed themselves and their family as healthily, ethically and environmentally sustainably as their budget allows. Classes incorporate discussions about reducing waste, eating seasonally, what is organic, buying local and how your daily food choices can help tackle global issues such as climate change, economic inequality and diet-related mental and physical ill health. A learning and social occasion our classes end with a shared meal. Made In Hackney also takes its program into schools, community centres and anywhere else with people with a desire to learn how to cook delicious healthy food that’s good for people and planet. To attend a masterclass or community class, volunteer or make a donation, please visit Made In Hackney’s website.